Reinvention is essential. Sitting still is as fruitless in design as it is on the racetrack. 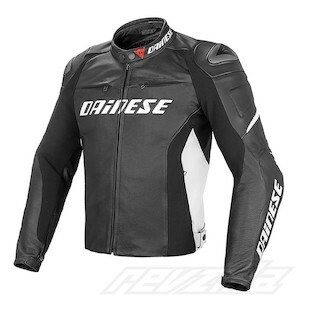 Looking to progress the line of the long-living Dainese Racing series of motorcycle jackets, Dainese now is introducing the newest iteration for their 2015 Collection. 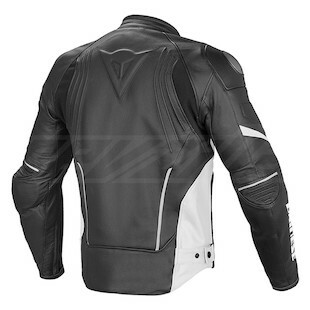 With a combination of Tutu cowhide leather and S1 fabric in the construction of the outer shell, movement, comfort, and protection have been made paramount in the new Dainese Racing D1 Leather Jacket. The main differences between this year’s model and previous editions can be seen in features such as the rubberization of previously metal collar snaps, micro elastication at the elbows/shoulders, added dual pockets for chest protectors, and covered cuff zippers to meet the CE-Cat. II Directive for certification. The Dainese Racing D1 Perforated Leather Jacket is also available if you are looking to keep cooler while pushing the limits at the track, or riding responsibly on the streets. With all of the same construction as the non-perforated option, such as co-injected shoulder protection, NanoFeel liners, and pockets for a G1/G2 back protector, this option will increase ventilation for the hot summer months. Resting on the success of an original is not enough to stay in the game. We demand more as riders and are constantly looking for valuable upgrades to past models. By reinvigorating the Racing series of jackets, Dainese has given us just that kind of upgrade with the new Racing D1 Leather Jacket and Racing D1 Perforated Leather Jacket.